In the 16th century, Spanish conquistadores had noticed the native peoples' fine artifacts of gold and silver long before any legend of "golden men" or "lost cities" fired the imagination of kings and commoners alike. The prevalence of such valuable artifacts, and the natives apparent ignorance of their value, supported the native rumors as to a plentiful source for them. The Spaniards settlers in New Spain (now Mexico) began to pursue these mythical "Seven Cities of Gold" that they heard were located across the desert, hundreds of miles to the north. 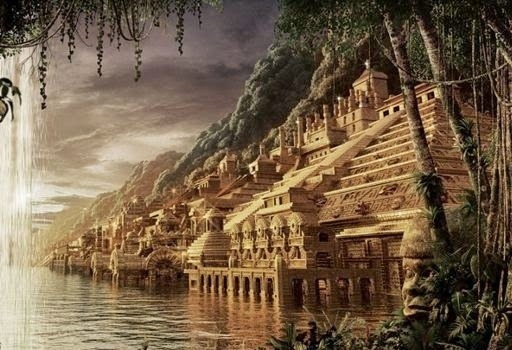 Supposedly situated somewhere in south western Continental North America, these legendary cities were said to be filled with great and limitless riches. Essentially, the Seven Cities are the El Dorado (Spanish for "the golden one"), of North America. 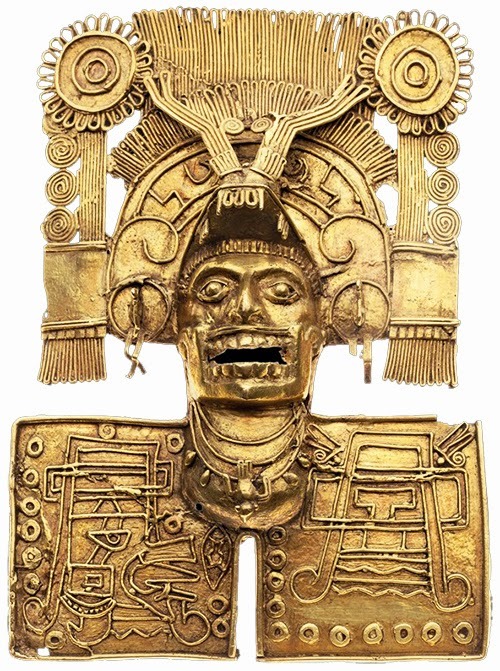 Originally El Hombre Dorado (the golden man), El Indio Dorado (the golden native), or El Rey Dorado (the golden king), was the term used by Europeans to describe a tribal chief of the Muisca native people of Colombia, who as an initiation rite covered himself with gold dust and dove into Lake Guatavita. Conquistadores Lázaro Fonte and Hernán Perez de Quesada attempted (unsuccessfully) to drain the lake in 1545 using a "bucket chain" of labourers. 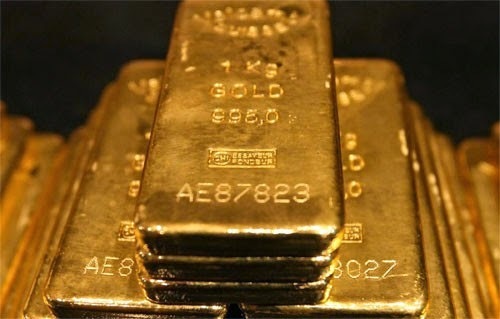 After 3 months, the water level had been reduced by 3 metres, and only a small amount of gold was recovered, with a value of 3000–4000 pesos (approx. 100,000 USD today; a peso or piece of eight of the 15th century weighs .88oz of 93% pure silver). Later, it became the name of a legendary "Lost City of Gold", also known as Manõa, that fascinated explorers since the days of the Spanish conquistadors and was supposedly located on Lake Parime in the highlands of Guyana, South America. 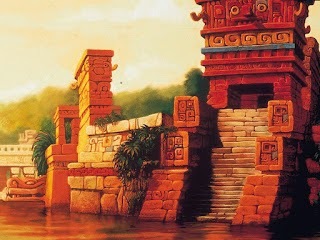 There are all kinds of romantic legends connected with these lost cities, especially in regards to why they fell into ruin, abandonment, and were eventually forgotten. The stories may have some of their roots in an earlier Portuguese legend about seven cities founded on the mysterious island of Antillia by a Catholic expedition in the 8th century. It was said that a sizable group of Visigothic Christian bishops fled to the island from the Muslim invasion of the Iberian peninsula, taking vast riches with them to eventually settle on an island somewhere in the Atlantic. In both cases there exist actual ancient documentation and maps, but nothing concrete has ever been officially found, leaving the Seven Cities in the realm of legend. In 1539, the Spaniard Francisco Vásquez de Coronado led a large expedition north from Mexico to search for wealth and the "Seven Cities of Cibola". Instead of wealth, he found farming peoples living in the flat-roofed adobe towns in what are today Arizona and New Mexico. These were what remained of the Hopi, Zuni, and was inhabited largely by the Pueblo Indians of today. Coronado was disappointed by the lack of wealth among the Pueblos, but he then heard of a wealthy civilization named Quivira far to the east, where the chief drank from golden cups hanging from the trees. The Quivirans were simple people. Both men and women were nearly naked. They “were large people of good build” many of the men being over six feet tall. They seemed like giants compared to the Spaniards. Disappointed at his failure to find wealth, Coronado turned his face toward New Mexico and marched back across the plains. By the mid-1570's, the Spanish silver strike at Potosi in Upper Peru (modern Bolivia) was producing unprecedented real wealth for many. In 1695, bandeirantes in the south from Sao Paulo struck gold along a tributary of the Sao Francisco River in the upper highlands of Brazil. This new prospect of real gold over-shadowed and replaced the promise of "gold men" and "lost cities" in the vast interior of the north, leaving them as myth and legend.